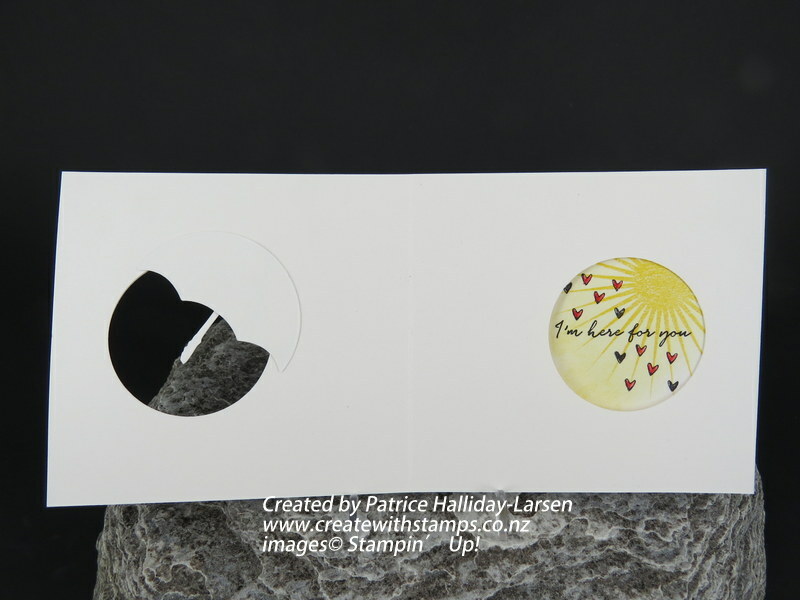 It’s time for another Global Fancy Folds Blog Hop, and this month we are showcasing the Peek A Boo Hidden Message Card. Make sure you check out what the rest of the design team have come up with, the cards are amazing. We have been having a lot of rain around here lately, with the odd bit of sun peeking thru from time to time, so I decided to base my card around the weather theme lol. Naturally, the ideal set for that is the Weather Together Bundle, it is such a cute set. Anyway here is the card that I have come up with for this month’s challenge. I coloured and shaped the umbrella, but to maintain the shape I really needed to pop the centre portion of the umbrella up using dimensionals. The problem was I wanted to adhere the umbrella partly over the window hole which meant there was no cardstock behind the umbrella sooo that was not an option. Hmmm lightbulb moment, I could rectify that problem by stamping and cutting out a second umbrella and adhering that behind the window. I then adhered the second umbrella on top by using dimensional in the centre and the fine tip glue pen around the edge. Here is a close up of what I have done. This is what the card looks like when it is fully opened, it has now changed from the ladybugs to a saying, pretty cool huh. and here is the card when it is semi-opened, notice how the background piece of card is sliding into place. Here is a top view of the card so that you can see how the front layer has been scored and folded so that it slips in between the inside and back layer of the card. Shimmery White card (ideal card if you want to watercolour). 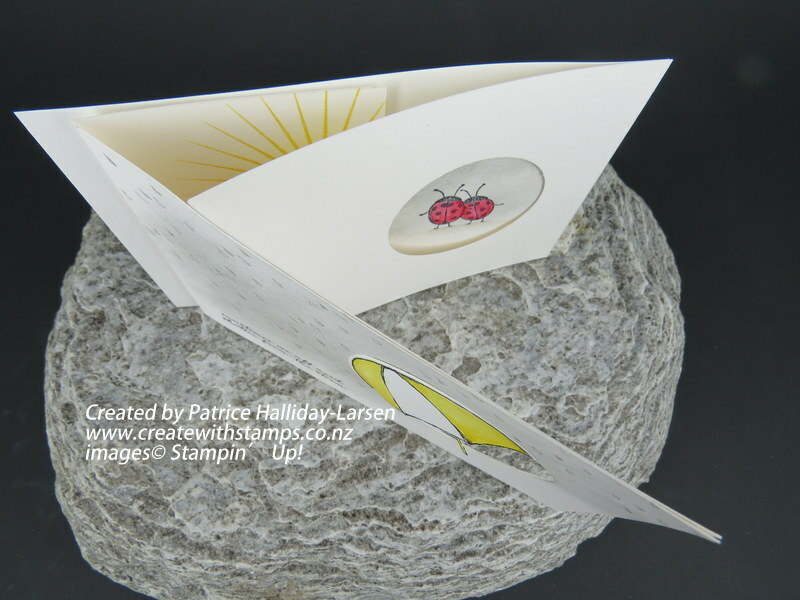 – Make sure you do all the stamping, the wash background and punching before assembling your card. – Create the wash background on the card front by using an Aqua Painter and Smoky Slate ink. Allow to dry and then blend a little more by lightly sponging over the top using the same colour ink. Stamp the words and raindrops using Smoky Slate ink. 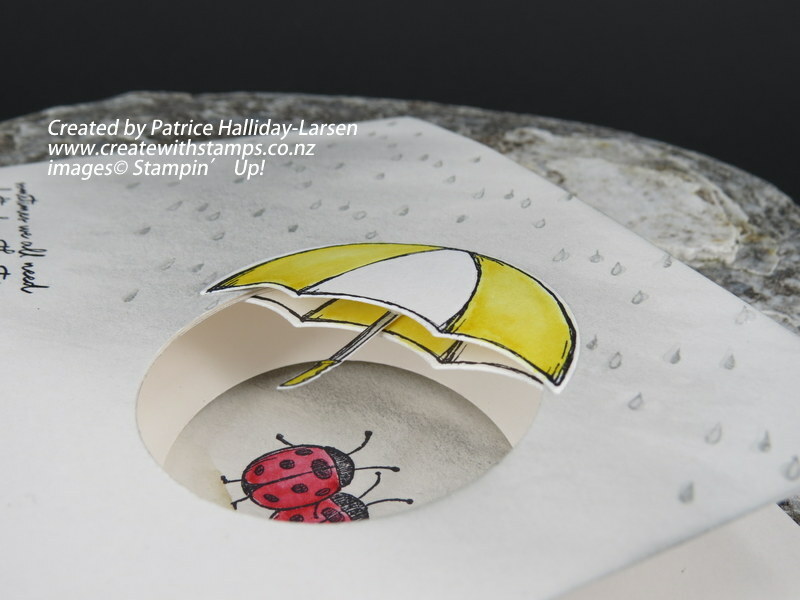 – Stamp two umbrellas using Black Archival ink, watercolour and cut out with dies. 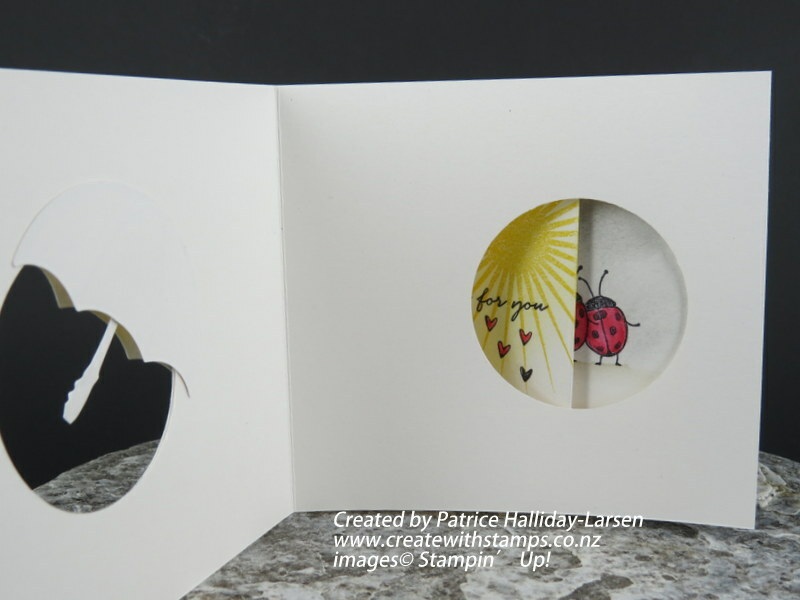 – Punch window using 2″ Circle Punch from the card front, line up side edge with centre card, trace thru window and punch the second circle. Fold centre piece in half, trace thru window, open and punch out the third circle. 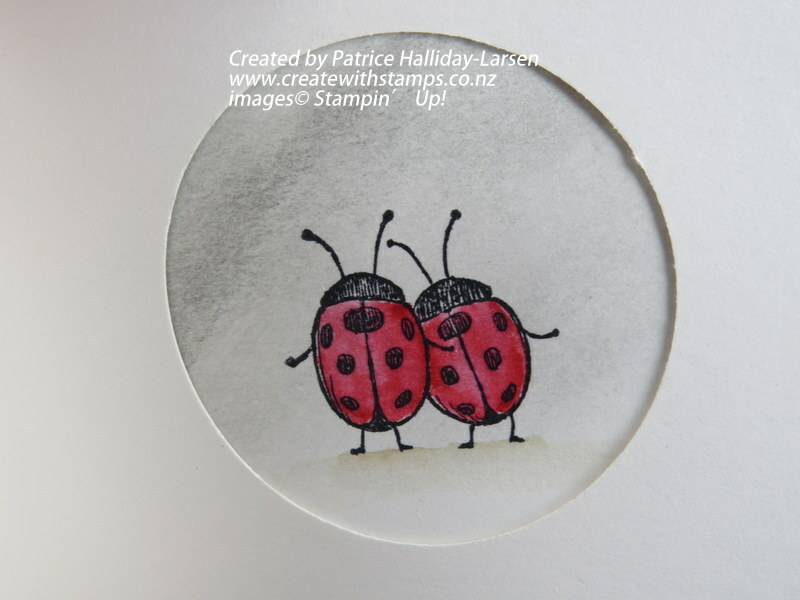 – Line up the side edge of the centre card with the back piece of card, stamp ladybugs thru window. Watercolour image and sponge background. – Adhere card front and centre by lining up the side edge, the windows circles should line up. – Open card front so that the inside panal slips into place, stamp saying thru window. Open card and stamp the hearts and sun. Colour hearts using your Aqua Painter and sponge background. – Adhere umbrella behind window and then adhere the second umbrella on top (over the front window) by using dimensionals in the centre and the fine tip glue pen around the edge. – Put a strip of tape down the front right-hand side edge of the back card and adhere to the back of the folded inside card by lining up the side edges. – Use the Fine Tip Glue Pen to create the raindrops. For some more inspiration make sure you pop on over and visit the rest of the design team and check out their fabulous card ideas, you can do this by clicking on the next button below. Let’s start by looking at the gorgeous card Monica Gale has come up with this month. If you would like to order any of the Stampin’Up! products I have used on this card or have any questions, please contact Patrice. You can also place an order online or find out more about the product by clicking on the image that interests you below. 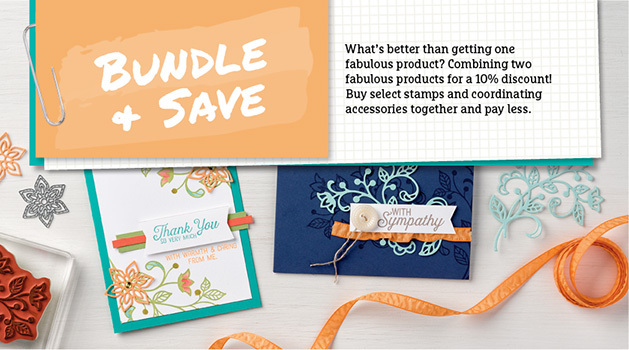 Please note that the Love You Lots stamp set is only available thru hostess benefits (orders or parties over $300). I LOVE your card. So cute. So adorable! Thank YOU so much for sharing! I love what you did. I’m going to make my own card like this. I have a special that would love an unexpected card like this. Again, Thank YOU for sharing. Thanks Gloria 🙂 so pleased you like my card enough to want to make it. 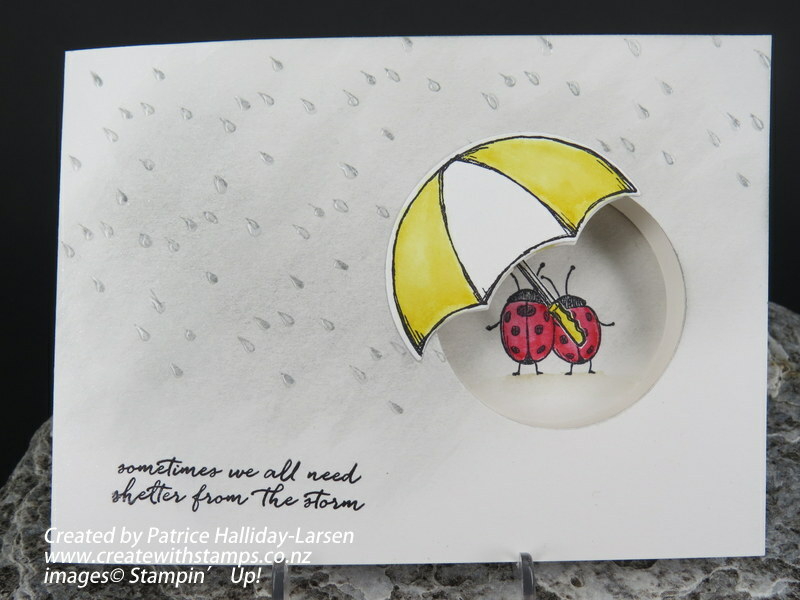 This is the sweetest card Patrice love the neat little umbrella and the fun theme of the card! Love your card but I am having a dilemma understanding where the top of the center card stock adheres to the front. Thanks in advance for your answer. Sorry have only just seen your comment, I have not been well. I taped around the edges and around the circle on the front inside portion of the card. I then adhered it to the back of the main front card by lining up the the right hand edges. I will take some photos and share them on the post to give you a better idea. Thank you so much for your time. Hope you are getting better!